I am not so keen on the idea that power corrupts, and have already discussed this to some extent in an earlier post. My difficulty with this framing is multiple. For one thing, this saying maintains the pervasive belief that power is bad in and of itself, a belief that can only result in perpetuating itself, since it will keep many people away from taking power lest they oppress others. As I see it, coming into power does not create the fundamental desire to have things be our way; it only provides access to resources that make it possible to do so. In the process, extraordinary harm can be done to others, sometimes millions of others. Whatever our sphere of influence, and whatever our vision or personal goals, our power gives us access to extra resources, and thus can multiply both our benefit and our harm. There is no substitute for meticulous attention to the effects of our actions. I see it as an enormous challenge to come into power and live its attendant responsibility without creating harm. I am concerned, in part, that less of this work will happen for as long as we continue to believe that the issue is power rather than what we do with it. My hope remains that that we can all recognize that we can have power and still not use it over others. If powerlessness is associated with purity, then those without power are, by necessity, better in some sense. This absence of humility is one of the reasons I see for why when previously oppressed people come into power they often recreate what was done to them. In fact, we don’t have to go very far. Every parent was once a child with their own parents who, most likely, didn’t leave them very much power. As research seems to indicate, and many, myself included, believe is deeply true, every time a parent mistreats a child, we can assume they were previously mistreated. Not engaging with the effects of being powerless, and, especially, denying the effects of internalized powerlessness on our ability to make choices that take the effects of our actions into consideration, can have serious and harmful effects (see Power Under: Trauma and Nonviolent Social Change, by Steve Wineman). The most painful example for me is what happened to my own people, the Jews, after many centuries of oppression and lack of sovereignty in particular. When political independence suddenly gave us the state of Israel, with it came the possibility of oppressing others. 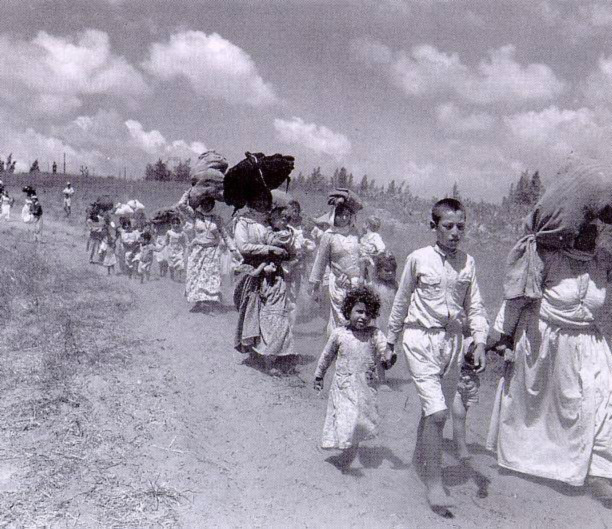 Right in the wake of the Holocaust, my parents’ generation participated in mass expulsion of hundreds of thousands of Palestinians from their homes, sometimes after many centuries of living there. My own generation and beyond engage in an occupation that deprives the Palestinians of livelihood, political independence, oftentimes of survival, and almost always of dignity. I have yet to be able to breathe fully enough when I contemplate this turn of events. I feel a tremendous urge to pull away and distance myself, a big factor that went into my choosing exile for all these years. I resist this pull, however challenging it is to stretch into a willingness to be a witness to what is happening. I keep choosing, as much as I can, to manage, internally, my appreciation for some aspects of my culture while holding in the same awareness the other aspects of that same culture that are so painful for me to know about. To whatever extent I do this, I expand my human capacity within myself – to hold complexity, to hold everyone with tenderness, to have empathy for many forms of being human. This is not an easy task. Part of what makes these kinds of situations so complex is that the people whom I see as oppressing others are not thinking, “Oh, it’s so wonderful to be powerful and abusive.” They’re thinking, “Oh my God, we’re so threatened. We’re so outnumbered. How can the world not see? There are millions and millions of them, and we are just a tiny poor nation just trying to eke out a living, and they are being anti-Semitic when they call us racist.” From within it makes complete sense. The fear and concern are not fake. The people living in Israel are not focused on the harm that they are creating for Palestinians and Bedouins, for example. They are focused on their fear about what Palestinians and others could do to them. This fear and what I see as a distortion make Israelis more dangerous than if they knew they were the most powerful nation in the Middle East, because it makes them less likely to see the effects of their actions, and even less likely to take ownership and responsibility beyond justifying the choices made. My high point of a training I once did for a group of union organizers was the moment when they were able to see and acknowledge that if they had power, they would treat management as poorly as management was treating them. This example is key to me for illustrating why we need to do the work of transforming our judgments and continuing to see the humanity of everyone, including those whose actions we most deeply deplore. The more extended the period of powerlessness, the more important this inner work is. Unless we are able to see the humanity of others along with healing from the effects of our own traumas of powerlessness, nothing will protect us strongly enough from becoming oppressors if we come into power. This entry was posted in Uncategorized and tagged israel/palestine, Martin Luther King, power differences, Steve Wineman on September 26 / 2013 by Miki.